New Zealand beat Australia to win the first round of the HSBC World Rugby Women's Sevens Series 2016-17 in Dubai. Australia and New Zealand played out yet another thrilling final in Dubai as the Black Ferns Sevens claimed the first round of the HSBC World Rugby Women's Sevens Series 2016-17. In front of a packed house at 7he Sevens Stadium on Friday, New Zealand exacted revenge for their Olympic gold medal match loss in Rio, dominating their rivals to win 17-5. Australia battled to the end of the 14-minute final, but tries from Portia Woodman and two from Rebekah Cordero-Tufuga saw the Black Ferns Sevens collect the gold medal and the Dubai Sevens Cup. Kelly Brazier, who came back into the team from 15s action last weekend, was named HSBC Player of the Final. Your women's Dream Team for the #Dubai7s! The win was especially sweet for new coach Allan Bunting, who said: "We're pretty stoked with that win. It's been a while since we got a win over Australia and I'm sure they'll go away and come back a lot stronger as a result of that match. "We always go out to win but we're still learning a lot. Most importantly the girls went out and played with heart." New Zealand playmaker Tyla Nathan-Wong added: "Honestly it's the best feeeling. This team is incredible ... I'm so proud of them. I can't wait for the next round because I'm loving this team. "It was pretty hard losing to Australia in Rio but full credit to the girls today." Meanwhile, Russia and England faced off in the battle for bronze. A young England team battled hard but two tries by Elena Zdrokova and one from Alena Mikhaltsova ended Russia's impressive weekend with a 19-14 win and a bronze medal. Fijiana bounced back from their last-gasp quarter-final exit to England to finish fifth, scoring two second-half tries to beat Canada 17-14. France also finished with a win, Lina Guerin scoring two of her side's tries in a 31-5 victory over South Africa in the seventh place play-off. Meanwhile, in the first-ever Challenge Trophy, which replaces the Bowl competition, Spain took on Ireland in a tense affair on pitch one. Tries from Megan Williams and captain Lucy Mulhall, as well as some tough defence from the Irish, helped them seal a 14-12 win over a resilient Spanish side. The USA finished 11th after a tight 26-17 win over Brazil. Russia had much to prove in Dubai and were worthy winners over Canada in the quarter-finals, but they struggled against a slick New Zealand outfit in the last four. Nadezda Kudinova managed to breach the Black Ferns Sevens' defence but another two tries from dream team selection Michaela Blyde saw them run out 24-5 winners. Australia faced a youthful England side captained by Abbie Brown in a battle for a place in the gold medal match against New Zealand. Arguably the most impressive player was Tiana Penitani, who shook off an injury sustained on day one to score two tries and inspire her side to a 31-10 win. In the first match of day two in Dubai, New Zealand took to the field against South Africa, the team invited to compete alongside the 11 core teams in this opening round of the series. The Black Ferns Sevens were in imperious form, though, with both Blyde and Portia Woodman scoring hat-tricks in a 39-0 victory to send a message to the other teams in the knockout stages. Russia’s failure to qualify for the Olympics was surely a reason for their improved performances in Dubai, and they tore into Canada in the morning heat on pitch two. Tries from Kristina Seredina and Daria Bobkova set the tone and despite a converted Julia Greenshields' try for the Canadians, Zdrokova ensured a dramatic win and a semi-final spot for the second year running in Dubai. England looked relieved after their quarter-final clash with Fiji and with good reason. Fiji were by far the more dominant team and showed the traditional Fijian flair as they raced to a 17-5 lead. However England’s experience shone through and tries from Alice Richardson and Jo Watmore saw the Red Roses battle back for a 19-17 win at the death. In the last quarter-final, Australia stormed out of the blocks to beat France 42-0, with Emma Tonegato adding another two tries to her tally as the French were brushed aside easily. 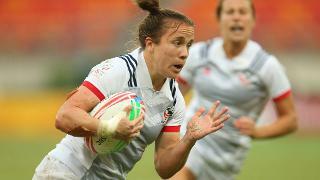 The HSBC World Rugby Women's Sevens Series now heads to Sydney in February with New Zealand leading the standings.